The year 2017 was a successful year in my producing of daffodil seed from many of my crosses but not all. Probably the words that I say in the following will be laughable to the experienced hybridizer, but I’m hoping that anyone new to hybridizing will get something of what I have to say below. 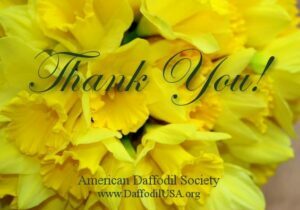 Harold Koopowitz has written several articles in the Daffodil Journal and the RHS Journal on hybridizing that I have found as both interesting and informative. These few paragraphs are inspired by Harold’s article in the September 2015 “The Daffodil Journal.” I started hybridizing the first couple years after I got into showing daffodils but my major objective was to see it the concept of hybridizing worked. In short, it works. You take pollen for one daffodil and you apply it to the stamen of another. You get seed, you plant them and in a few years you have new daffodil cultivars. Each seed that produces a plant is a new cultivar, verses you get the exact same cultivar with bulb division, or in other words a clone. My pot plantings were a disaster as I was spending 12 to 14 hours a day either at work or commuting to work and all my pots dried up and died. My few remaining seed in the ground gave me nothing to take home and show mom. In the early years I was all into the “Robins” each spring. Now they are totally gone. I did learn a lot by reading the hybridizing robins as each hybridizer would add comments to the one written by the chairman of the robin to get it started each year. I had an initial interest in bulbocodiums . After many years of effort I came to the conclusion that was obvious to others; you cross a yellow bulbocodium with a yellow bulbocodium and you get a bulbocodium. I did get lucky and with a cross onto a white bulbocodium with a light yellow bulbocodium I did get a bi-colored bulbocodium. In another attempt I put pollen from a yellow bulbocodium on N. fernandesii and got a small well formed, heavy substance 10Y-Y that I named Suzy Q that has won at least two mini Gold Ribbons. Mostly I got frustration. Graham Fleming helped me a lot with my hybridizing and shared a lot of his confidential information with me but I must be thin in the brain because I didn’t get what he was telling me until I read the articles from Harold Koopowitz. Then like the light bulb came on in my brain that if I used many of the fertile miniatures with some of the intermediate standards, there is a good possibility you can get miniature hybrids and maybe some color as well. That works as well and my hybridizing has changed. Where I had no goal in my hybridizing, I now my goal is anything in the miniature division 2 range. In the last three or four years I have used the pollen from ‘Elka’ 1W-W miniature, mini-cycla 6Y-Y, N. cordubensis, N. fernandesii, N. henriquesii and N. watieri along with others to breed hopefully new daffodils. I was awarded this year with two new blooms from my crosses that were 2Y-O/R (miniature I think) however they did not bloom at a time that I could show them, so I held my breath and let them stay in the garden. My optimism has to stay under control because I have had so many promising hybrids that did make after the initial bloom. I’ve had two standard rose ribbons that did not come back the next year. But you press on and keep trying. This year I had a lot of luck getting seeds from crosses with ‘Elka’pollen with most anything in the garden. I also had luck with N. fernandesii var cordubensis, and N. fernandesii. I was able to get seed set using pollen from mini-cycla applied to ‘Cayenne’ and ‘Camborne’. I have a lot of ‘Cayenne’, ‘Camborne’ and ‘Pink China’ but you never see me enter them in shows; hybridizing is more important to be. My crosses with N. watieri was hit and miss as I was able to get a lot of pollen from watieri this year, but watieri pollen did not take on my N. Poet Hellenicus, or ‘Pink China’, but did take on a couple of my poet seedlings. Most of my N. fernandesii crosses did not take either. I did get one N. fernandesii cross on a ‘Cayenne’. Likewise I was fairly successful in my standard division 3 crosses. However, my division 1 crosses were mostly a bust. I have a lot of seeds to be planted that I hope will be in the ground in June. I’m a little busy at the time of this writing as it is bulb digging time in Northeast North Carolina. A lesson learned from the strange winter we had this year. I was warm and summer like in February here in 2017, and I made a lot of cross that I expected to see seed in about 6 to 8 weeds. We had a cold March and all the seeds that I was expecting early were halted in development by the cold and when I started hybridizing again after the cold snap most of the early seeds from my crosses came ripe only a week or so before the later crosses. Lesson learned, cold weather slows down the development of seed. Hybridizing is the fun of daffodils. Showing daffodils is the social part. I’m glad that I do both.